Kay Guitar Company has reissued three Barney Kessel signature models: the K1700V Pro, K6700V Artist and K8700V Jazz Special. The three reissues share features inspired by the original Kessels. The Artist and Jazz Special each sport a Bat Wing-shaped lucite pickguard with a gold leaf Barney Kessel signature and gold “K” chevron emblem. The Pro’s lucite pickguard, however, only features Kessel’s signature. Other familiar elements include a Kelvinator headstock (a nod to Kelvinator refrigerators of the era) and a pair of gold, Kleenex box-shaped single-coils voiced for a warm 50s tone. These pups can be shaped by four reflector “radio knobs” – two volume and two tone – as well as a three-way pickup selector. All three axes feature a single-cut, arched top hollowbody build. The Artist and Jazz Special have a parabolic arched flame maple back, flame maple sides and a three-ply spruce top with f-holes. The Pro shares similar tonewood specs, but features a three-ply flame maple top instead. All three guitars have a 24.75-inch scale length. Their body widths, however, differ. They measure 13-, 15.6- and 17-inches for the Pro, the Artist and the Jazz Special respectively. 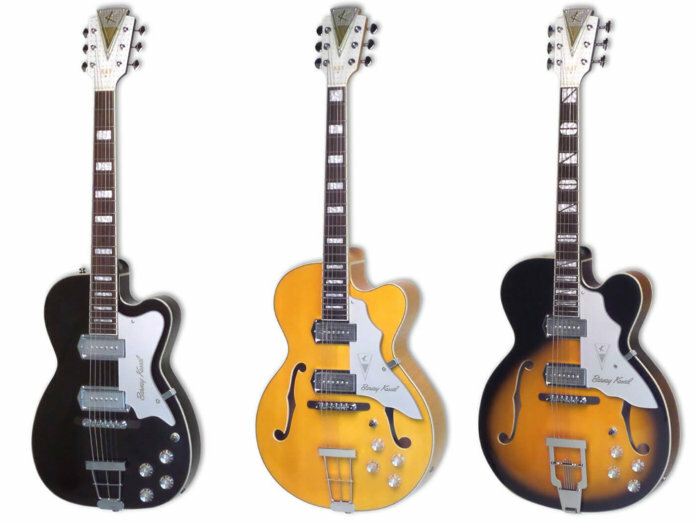 All three models are available in Natural Blonde and Tobacco Sunburst finishes. The Pro has an added option of a Jet Black finish. Each guitar lists from $800. More info at kayvintagereissue.com.